"The Attalan Deep" is the 31st Mandrake Sunday story. 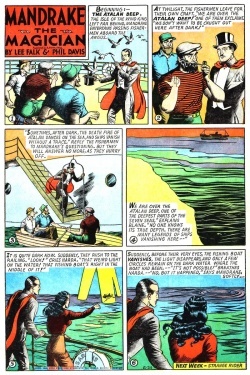 The story was written by Lee Falk and drawn by Phil Davis. Argus sails over the Atalan deep, then suddenly, before the eyes of our friends, a fishing boat vanishes in a weired light. Investigating the mystery our friends ending up in a dome at the sea bottom. Toltec (/Toltex), a man in Atalan. Atalan, a city ten miles under the surface of the sea. The title for this story is taken from the strip of June 17 and 24, 1945 (Next Week: The Atalan Deep / Beginning: The Atalan Deep). Alina, named after Lee Falk's mother or his stepsister Ailine (Aileen/Arleen). This page was last edited on 29 July 2018, at 16:17.